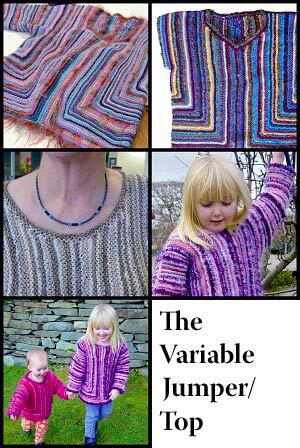 Make your own beautiful, creative and individual versions of seven different garments using odd balls of yarn and simple knitting stitches. None of the garments made from the patterns in this book will look like any other. No set yarn. Use different, thicknesses, textures and types, all combined. Use up your stash! No set sizes. Can be used for babies, children and adults. Many other useful knitting tips and techniques. See list of what is included. A new way of casting off which looks just the same as the regular way, but is quicker and easier! The 3 needle cast off for joining two pieces without casting off and sewing. 3 ways of casting on, including an invisible cast on technique. Weaving in ends of yarn as you knit, rather than sewing them in later. Picking up stitches from an edge. Basic patterning — how to work out how many stitches to use for your size, with your yarn.